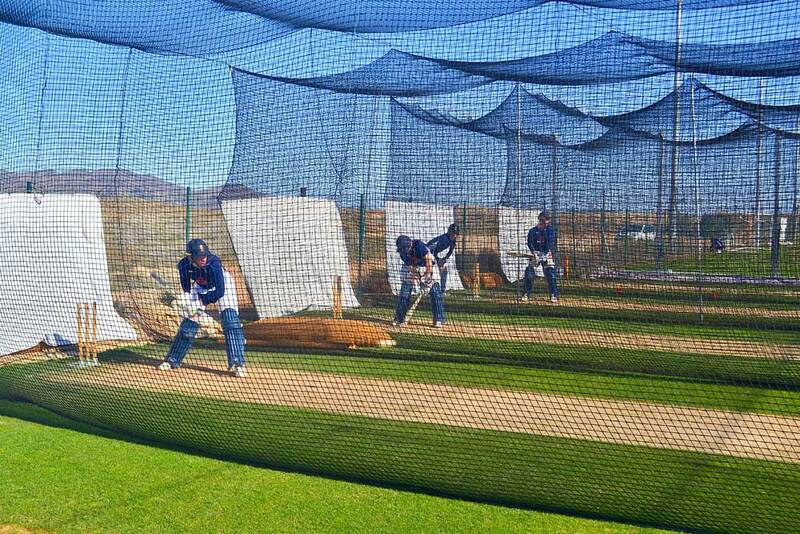 To find out more about ECB Young Lions click the logo. 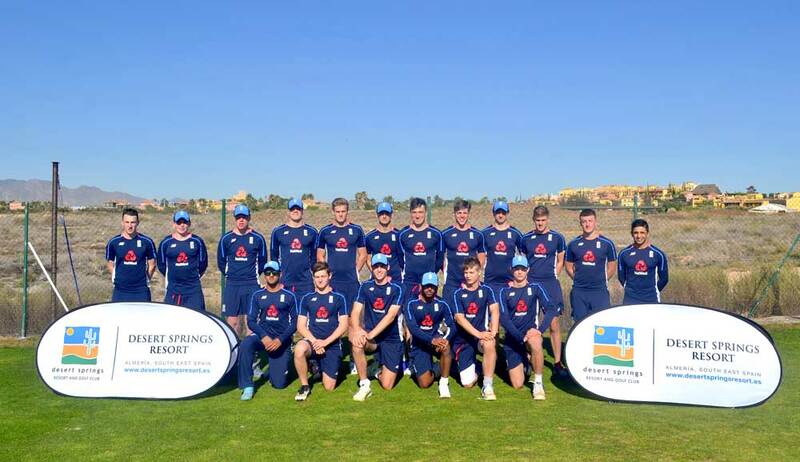 Eighteen (18) members of the ECB Young Lions Squad, accompanied by eleven (11) Management, staff and coaches are now back in England having completed a successful 3-day training camp between Saturday 11th – Tuesday 14thNovember at Desert Springs Resort, Europe’s only international award-winning luxury family resort and championship desert golf course with its very own dedicated Cricket Ground & Academy, in the Almanzora region of Almeria, Andalucía in south-east Spain. 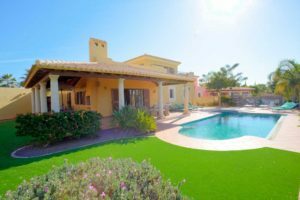 Accommodation is provided in the apartments, townhouses and villas available for holidays and short breaks at Desert Springs. Meals are served in the resort’s Crocodile Club Restaurant, part of the family-friendly Crocodile Club that is geared up for a wide variety of leisure activities and the award winning El Torrente Restaurant at the Club House. 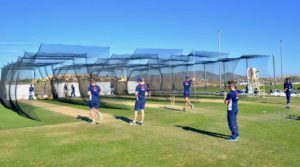 a cricket ground with an eighteen (18) wicket square, constructed to ECB standards and specifications that will be ready for play in February 2018 and will be open all year round. 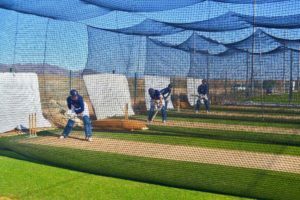 Complimented by a Marquee pavilion, sightscreens, scoreboard, sprint strips, and associated facilities, it provides an outstanding facility to practice and play cricket. 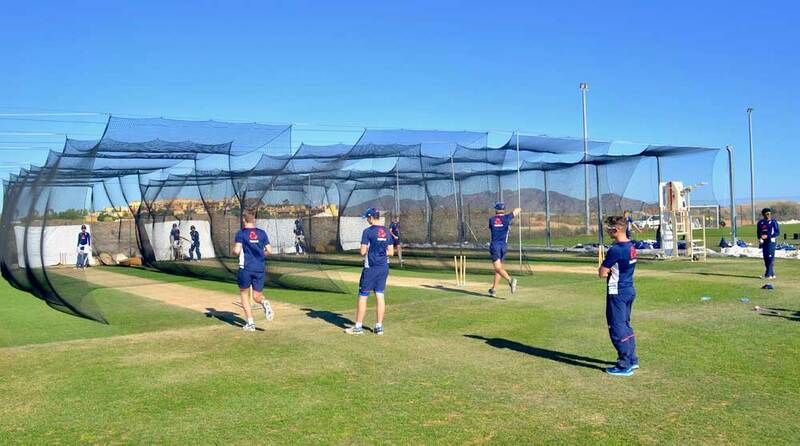 a Cricket Academy with facilities that comprise; twenty-four (24) grass wickets and run up with nets, one artificial wicket with nets, a full length artificial grass wicket, a Professional Bola Bowling Machine with 28 ball feeder, requisite training equipment and a specific hard standing area, which provides outside space for facilities such as a free weights gym, stretching mats and a medical area. Desert Springs Resort has been awarded the Daily Mail Best Almeria Award and the Bentley International Property Awards for the Best Spain Development and Best Architecture, as well as the Spanish National Madera Verde Prize for Environmentally Sensitive Development, the SICTED award for the distinction of “Commitment to Tourism Quality” and Andalucía’s Premier Tourism prize for 2017, the coveted and prestigious ‘Excellence in Management’ Award. Desert Springs takes its name from the region’s desert microclimate, which is unique in Europe. It has the warmest winter weather on the continent with an annual average of more than nine hours of daily sunshine and maximum daily temperatures of between 16°C (60°F) and 30°C (86°F) throughout the year. Annual rainfall is less than 200 mm. The Almanzora coastal waters are among the cleanest and warmest in Europe, attracting both fish and diving enthusiasts.